Autumn is one of my favorite times of year, especially when it comes to photography. Aside from football starting up, the MLB postseason (go Royals! ), and the weather finally cooling off after a brutal 75 degree California Central Coast summer, the aspens begin their annual transition. I chase the color every year, usually in the Colorado Rockies and Arkansas hardwood forests. This year, I had a chance to explore a completely new area - the Eastern Sierra Nevada mountain range in California. I took off the weekend before my wedding to have a little bachelor getaway with my good friend Tyler Brigham and my dog, Charlie. We made a loop down past the southern region of the Sierras, through the Mojave and up to Bishop for the first night. The color around Bishop Creek and Aspendell was fantastic, but different compared to what I’ve been used to. The groves in Colorado are something out of this world. Gigantic and mature, these organisms span entire mountain valleys and up into the alpine region of the Rockies. The groves near Bishop were small, young, and quite patchy. While still beautiful, many of the intimate scenes looking through the trees were snuffed out due to the forests being so thick and the trees being so immature. The three panoramic photos you see above are all from the Crested Butte area near Kebler Pass. From these three photos, you can really tell the difference between the forests around the Bishop, CA area and the giant forests of Colorado. The spacious, mature trees make for incredibly unique and textural images. Charlie had a blast on the trip. He had the chance to approve a couple exposures, meet some tourists, romp around in the wilderness, and even got to drive a little bit - his four favorite activities. The 8x10 got some good use on this past trip, and not including my evening through Yosemite on the way home (post to come later) I ended up shooting 3 sheets of film. Two of these were the aspen scene from above and the the third was from the scene below. The aspen scene above, I've entitled "Autumn's Grasp." I spotted the scene earlier in the afternoon on the day we arrived to the area and knew I needed the perfect low contrast light to photograph it. I set up well before sunset and waited for the calm twilight to come. As the sun sank well below the mountains behind me, the warmth of the sky above reflected a gorgeous light onto the grasses and aspens. I have been forcing myself to see more "intimate landscapes." These scenes are quite difficult to compose and photograph, but I find that as an artist, I strive to search for these compositions. They can be incredibly unique and have so much to say if you let yourself into the image. I composed this photograph intentionally symmetrical. I loved how the textures and colors stacked into perfect thirds, the brown grasses, the almost purple brush, and the pine trees, with that pop of fall color directly in the center. Something new from me, that's for sure. The white granite in the Sierra Nevadas is an absolute dream to photograph. Because of its silvery / white color, the stone reflects nearly every quality of light, especially during the twilight hours. In the photograph below, the calm twilight of sunrise sometimes known as "the blue hour" was reflected by the bright white granite foreground. Typically, I don't photograph many scenes with clear skies. Clouds add texture and interest to usually otherwise dull photograph, but this particular scene worked quite well with clear skies. With the small pops of fall color in the distance, you can almost feel the peaceful, crisp autumn morning when looking at this photograph. Because these photographs are so new and need drum scans and go through rigorous dust and spot removal, these are all still in their early stages of proofing for print. If you'd like to get your hands on one of these early proofs, fill out the form below to shoot me an email for a chance to own one of the first prints! Thank you! Michael will be in contact with you shortly. Michael releases one of his newest photographs, a 4x5 photograph taken on the Central Coast of California, near San Luis Obispo. This was taken at the height of the winter storms, at a stream that met the sea. F-Stop Shinn - For Cinema or Large Format? Michael discusses his opinions of F-Stop Gear's newest pack called the Shinn - a pack designed with the cinematographer in mind, which is proving to be perfect for his large format 8x10 setup. It's that time of year again where fields of gold come alive across the Kansas prairie. 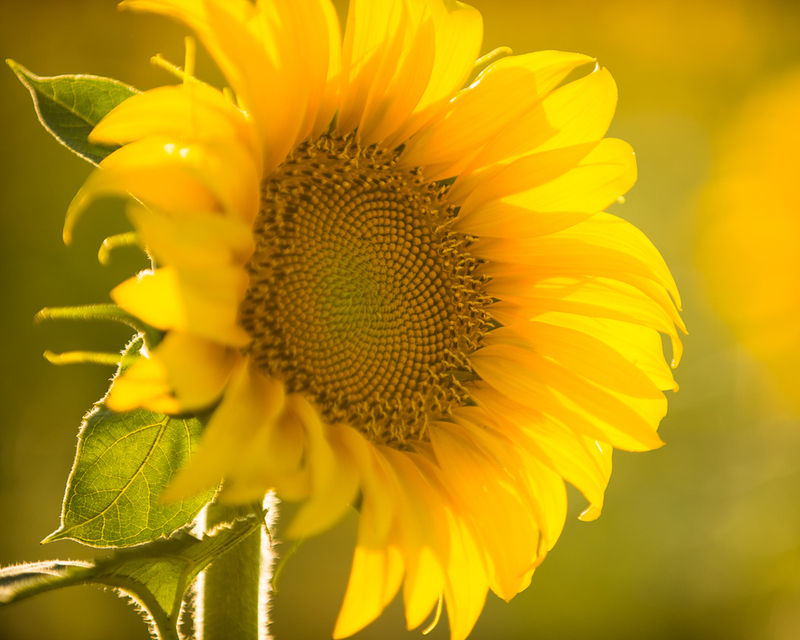 Seeing fields of perfect, golden sunflowers stretch for miles on end is a remarkable experience. 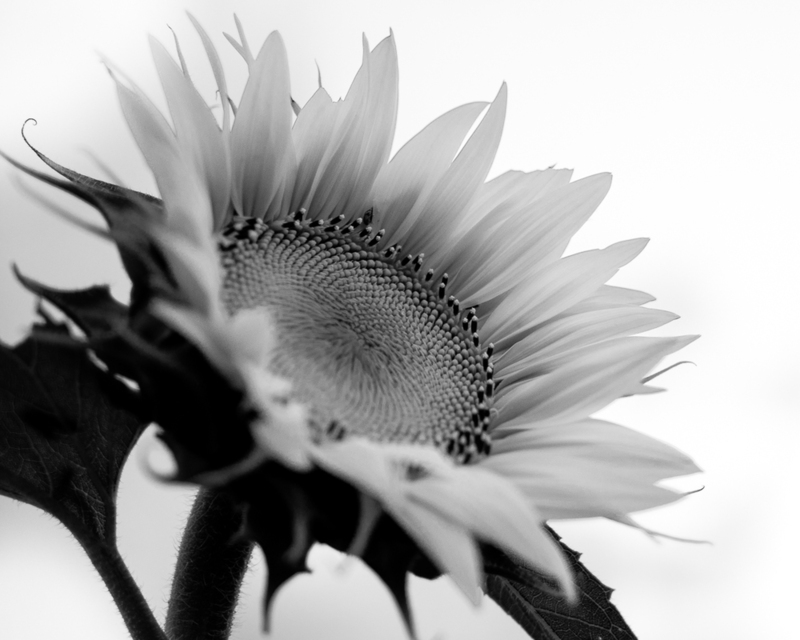 Sunflowers are something that have been a part of my life since I was a child. I remember seeing the huge fields riding in the car with my parents on trips to Wichita or working with my mom and thinking how beautiful they were. When I decided to pick up a camera in my late teens, they were one of the first things I began to photograph. 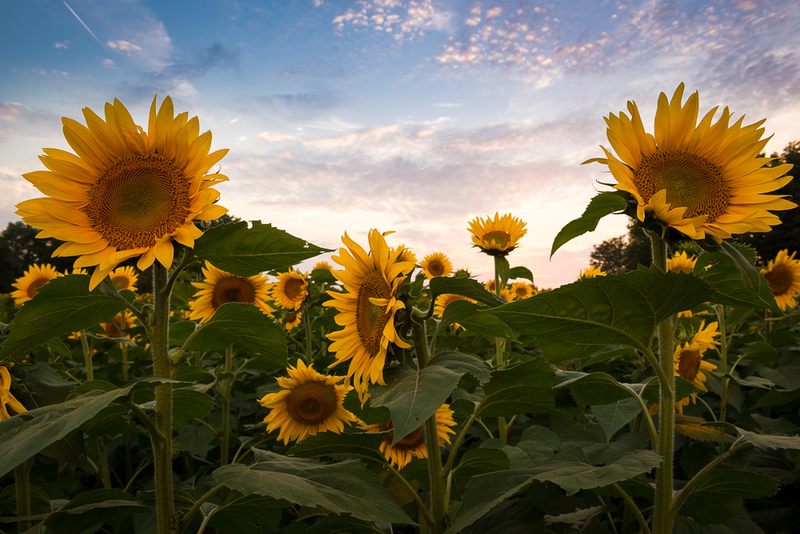 In honor of "sunflower season" I've decided to put together a little collection of my work with sunflowers in Kansas. If you're interested in purchasing any of these photos, check out the ones I have for sale in my Limited Edition Prints and my Open Edition Prints. Also, check out my new desktop print, which is the photo you see above, entitled "Final Moments." For information regarding this print and presentation, check it out here. Big Sur landscape photographer, Michael Strickland releases a new large format photograph from his favorite stretch of coastline in California. In early July, I hiked into the backcountry of the Desolation Wilderness, for my first true experience of California's Sierra Nevada range near Lake Tahoe. Here, I exposed several different scenes on my large format panoramic camera. Read about the stories behind the photos and more. I've now had my Arca Swiss F-Line Metric with Micrometric Orbix for a few months now and here are my initial thoughts regarding the camera's performance and functionality, along with the quality of one sheet of 8x10 film. Lightning streaks across the Kansas sky at sundown. 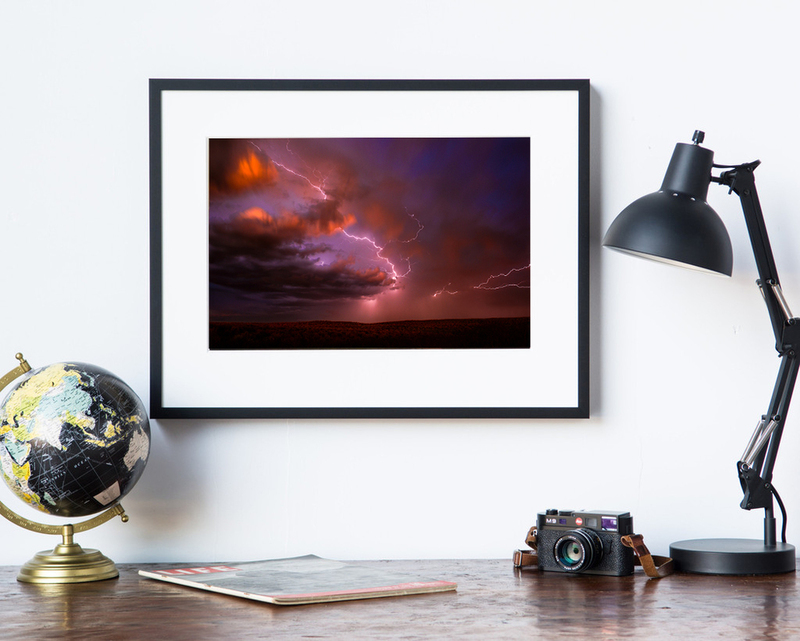 Spring is the time in the Kansas prairie where severe thunderstorms roll across the plains. Check out some of Michael's photos of severe thunderstorms on the Kansas plains and hear the stories behind them. Michael Strickland releases his new limited edition photograph entitled "The Sea of Gold." It was taken along the central coast of California on an evening in early April. The Flint Hills, to me, is home. The prairie is where I found my passion for landscape photography and it's where I fine-tuned my eye. The Flint Hills is a place where I can find peace in the busy world and the sights and sounds I miss daily. It's a different landscape. One in which you have to actively seek beauty -- it doesn't scream at you like so many other places. It has a subtle, whispering beauty that takes a trained eye and a love of the land. People always laughed when I said I was a landscape photographer living in Kansas. Kansas has its own unique identity, which in my opinion is incredibly beautiful. This was the last image I took in the Flint Hills before moving from Kansas to California so it holds a very special place with me. I miss the wide open spaces and the unique light that Kansas has. Kansas is still home and always will be, and I'm excited to be back for a few days this coming May. After visiting Montana de Oro State Park for the first time this past weekend, I feel so fortunate that it's located right at my back door. Montana de Oro has an incredibly rugged coastline with incredible texture that I can't wait to explore. On Saturday evening, the thick marine layer stumped any chance of golden hour light, so I decided to try to photograph a composition I had found the evening before on black and white film. I very rarely shoot in black and white, mainly because my eye is drawn to color images, but I've been trying to learn to see in monochrome. The cloudy evening fit the mood well as tide was rushing in over the rocks in the foreground. I captured this photograph on Kodak T-Max 100, which has been my favorite black and white film I've tried so far. in order to add more contrast to the scene, I decided to use a Red 23 filter, which also helped me lengthen the exposure to around 12 seconds to ensure the smooth texture of the waves. As soon as I had packed up and finished my exposures for the evening, a large wave crashed against the rock to my immediate right, which would have drenched me along with all of my gear. Coming from Kansas, I've been accustomed to the power of thunderstorms, but the ocean is on another level. Watching the water raise and lower 20-30 feet alongside a sharp rock face with every wave is an unreal experience. It's definitely a beautiful location, and I hope to return again when the flowers are in bloom and the sky blows up. We can all dream, right? Thanks for checking out my new website. If you haven't noticed, you can now purchase prints directly from my website without the need to contact me (although you still can if you'd like). I've also began offering open edition photographs with a slightly different twist. Saw and Mitre is going to be the sole framer for this series of photographs, which has been incredibly exciting for me. The quality and craftsmanship that goes into each one of these frames is amazing and they're built right here in the USA! Another thing is these prints are all hand printed by me using a cotton rag, archival paper on a professional quality injket printer. This differs from my light exposed Limited Edition photographs. Check out the open edition photographs here.